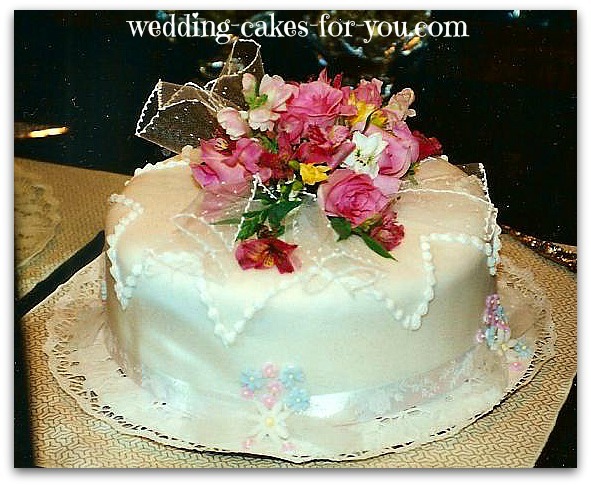 Wedding Anniversary Cakes are often replicas of the original. View the vintage collection here to inspire your designs and ideas. 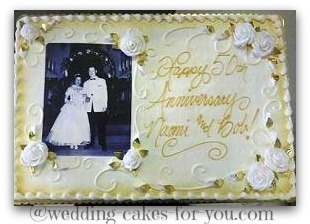 "I made a 50th anniversary cake for my parents. 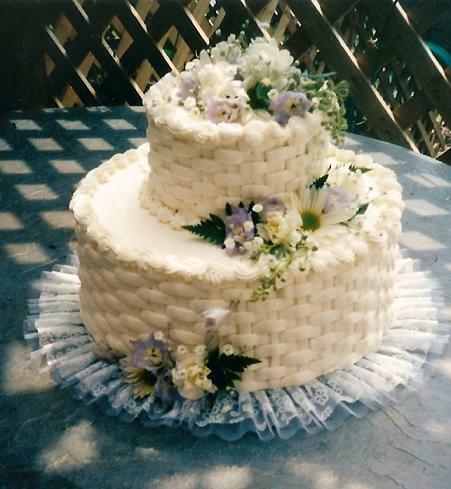 I have never taken a cake decorating class, so everything I learned was from the internet. 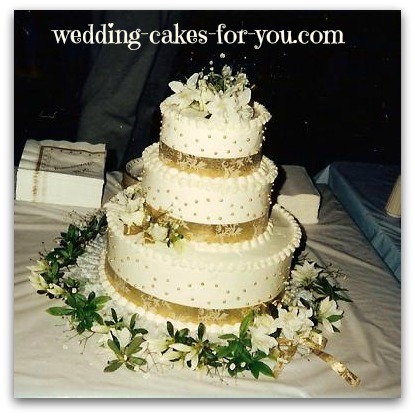 The Wedding Cakes For You website was very helpful, I used the amazing carrot cake recipe for the top layer. Everyone at the party loved it. I appreciate all the helpful tips & look forward to my next excuse to make a cake. 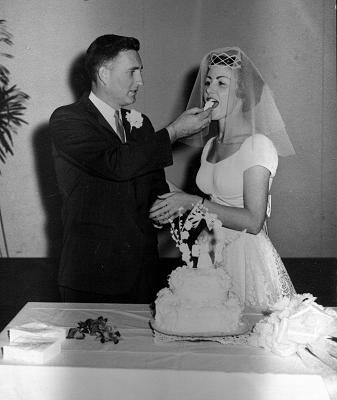 Enjoy the video below of the making of a 50th wedding anniversary delight for a sweet couple who had never had a fancy tiered creation for their wedding. 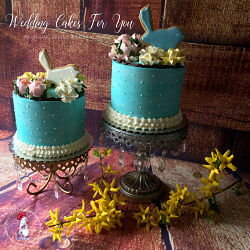 They were quite surprised when they were presented with this adorable three tiered sweet design with little homemade wedding figurines on top. 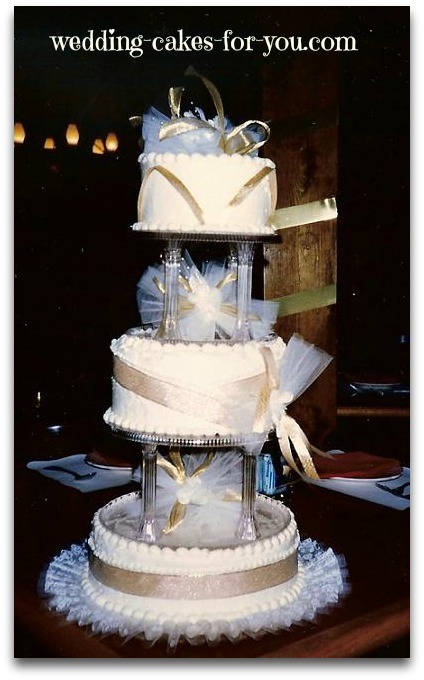 You will see from start to finish (sped up in some parts) An example of cornelli lace, filling the layers, and stacking the three tiers together. "Your website has been my reference these days! Thank you for all of your tips and help. 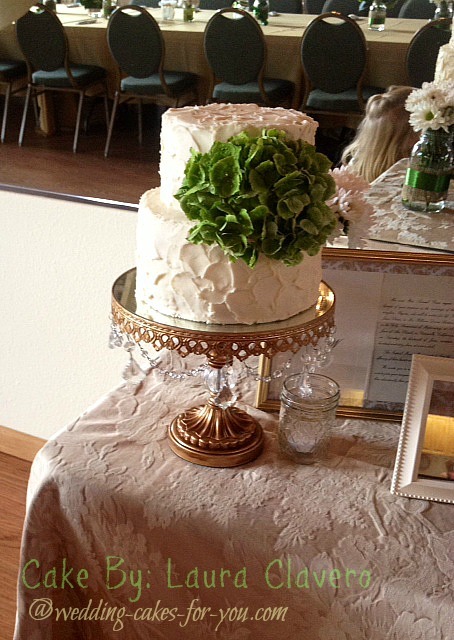 Here is a picture of the cake. 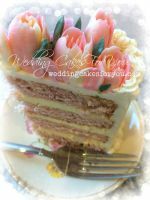 Probably the most simple cake, yet so elegant, that I have ever done. Thanks again!!!! It got rave reviews!" An old fashioned style with a photo of the couple is always a hit. 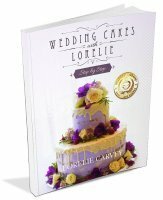 Sheet cakes are generally less expensive, so if you are looking to purchase or make a simpler design, you may want to consider this option. 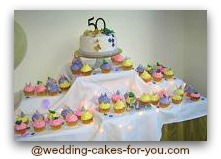 The picture of the cupcakes and cake above were shared by one of the many visitors to this website. 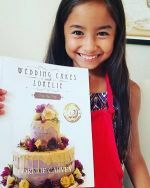 She used the orange cake recipe on this site and the Buttercream recipe a.k.a. 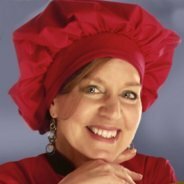 Italian meringue recipe. The final touch was the white chocolate and fresh raspberry filling. Click on the photo to read her story about this wonderful gift that she gave to her in laws. A very pretty and unusual design. 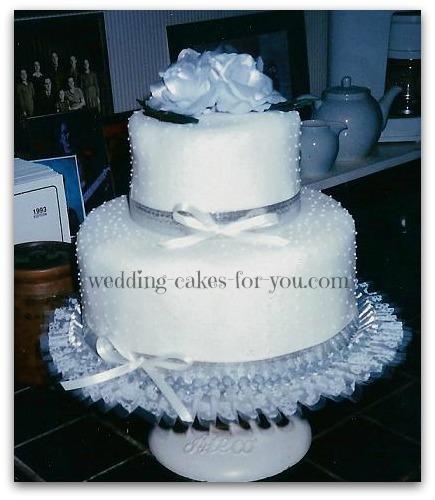 It is enrobed in a smooth rolled fondant. 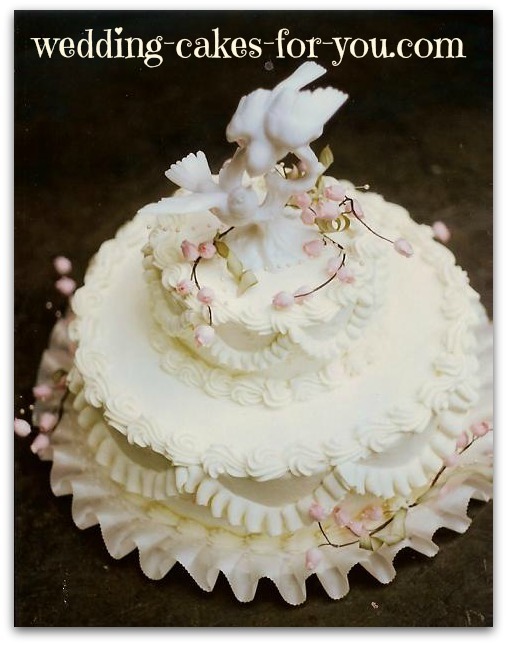 The loops are made with royal icing which is made using egg whites, confectioners sugar and cream of tarter. 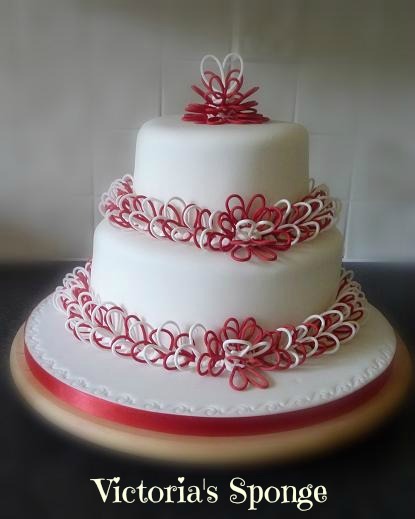 Royal icing is piped into shapes and allowed to dry. Once dried the shapes can be added for a three dimensional look. 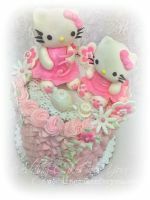 To see an example of how to use this method, go to the decorating videos page where you will find videos on how to make royal icing, a paper cone to pipe the icing and how to use it to make decorations. 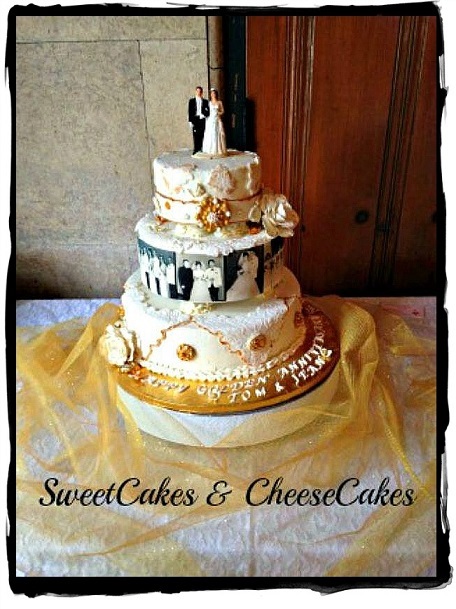 Collen designed this using actual edible photos of the couple. This story is not to be missed. 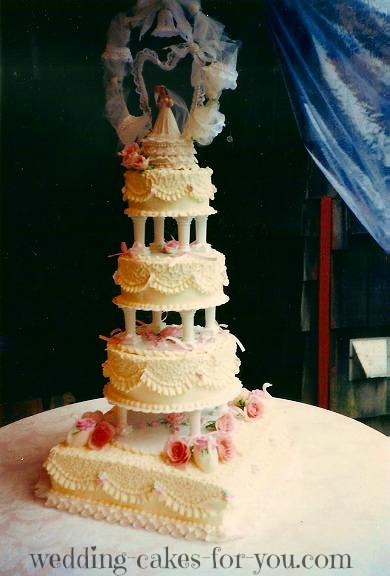 12 year old Abby recreated her grandparents cake in the photo below. She made them very proud.